Clearwater and Stormwater Victoria are continuing their popular series of networking events for practitioners involved in stormwater management. The 'Water Drinks' are an opportunity to meet colleagues in the industry and to share ideas, experience and perspectives on key issues in an informal environment. 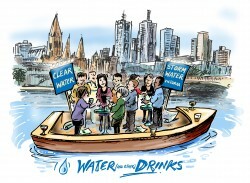 Our February Water Drinks at Boatbuilders Yard in South Wharf are always very popular so make sure you register ASAP (and help us by registering by the closing date!). Our theme for this event will be engaging the community with Integrated Water Management. Guest speaker Christy Arnott, from ASDF research (previously Social Research Officer at Moonee Valley City Council) will discuss community consultation and communication approaches that can assist organisations in IWM planning. We strongly encourage local government staff to attend and network with others on this topic. Light food and two drinks of your choice.